When the 2009 ELCA Churchwide Assembly authorized the development of a social statement on women and justice, issues related to the topic weren’t dominating the headlines. Nearly 10 years later, following the release of the statement draft, national conversations on sexual misconduct, gender justice and institutional sexism have taken hold in a way that suggests a lasting cultural impact. While the issues examined in the statement are timeless, they also feel timely. The ELCA Task Force on Women and Justice: One in Christ has been at work since 2012. Last fall the group brought the project to a crucial stage: the draft of a social statement on women and justice was released Nov. 15. A public comment period for the draft—which examines a wide range of issues, including gender-based violence, workplace discrimination, economic inequality, gender role expectations, and use of Scripture and theology—is open until Sept. 30, 2018. The task force is taking feedback in person and online. From 2013 to 2015, the task force heard from people across the ELCA through listening events led by its members and Process Builders, trained synodical representatives. These events were held in congregations, campus ministry organizations, synod assemblies and at the ELCA Youth Gathering, among other places, “to give people a chance to contribute to the process,” Wendel said. 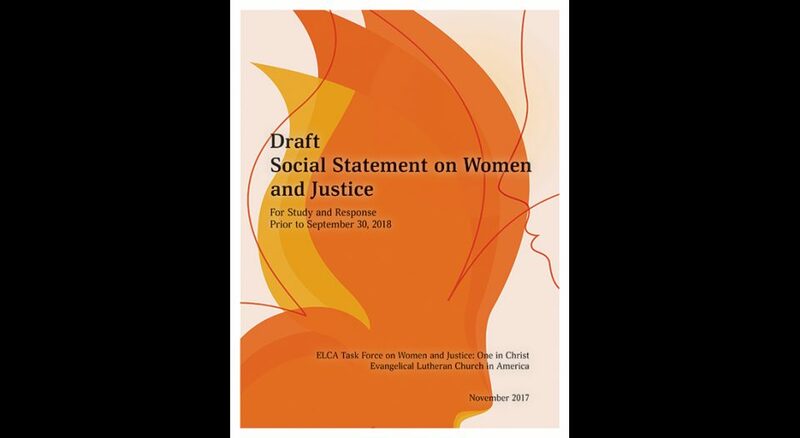 At the end of that process, the task force produced the study booklet “Faith, Sexism, Justice: Conversations Toward a Social Statement” in 2016, again inviting feedback throughout the ELCA. In 2017, “we released the draft that tries to cover most of the issues in a responsible manner,” Hagedorn said. The draft statement contains a series of assertions based on a common foundation of a confession of faith in the Triune God. These assertions claim God’s intention of abundant life for all; confess sexism and patriarchy as sin; name the resources of the Lutheran faith to address this sin; and articulate the ELCA’s work in these areas and its call to action and new commitments in both society and the church. The draft closes with an expression of hope for justice, grounded in trust in God’s promise of grace. Hagedorn also realized that the many layers that factor into identity—including race, economics, education, immigration status and age—add to the complexity of issues facing women. “I am grateful to be part of a church that speaks up on behalf of all who are made in God’s image,” she said. Task force members will review each response before preparing the proposed social statement this fall, which will then go before the ELCA Church Council next spring. A recommended proposed statement will be considered by the 2019 ELCA Churchwide Assembly, where a two-thirds vote is required for approval. Read the draft and participate in the comment period at elca.org/womenandjustice.